Paddling south on Lake Revelstoke. Natural Escapes Kayaking takes people on tours of the vast, quiet lakes around Revelstoke in homemade, hand-crafted vessels. Alight breeze floats along the surface of Lake Revelstoke, lifting up small waves that float south. I paddle slowly against the flow, my hand-crafted kayak slicing through the choppy surface of the cold water. Snow-capped mountains rise above. Behind, the lake spills over the Revelstoke Dam, while the trio of Mount Begbie, Mount Tilley and Mount Macpherson crown the horizon. I’m out for a tour with Natural Escapes Kayaking, a local outfitter that offers trips on Lake Revelstoke and the Upper Arrow Lake on home-made, hand-crafted boats. Joining me are three travellers making a pit stop in Revelstoke while on their way from Vancouver to Banff and back with the Moose Travel Network. There’s Steph, from England, Grace, from New Zealand, and Hayward, from the Netherlands. Leading the way is Terry Beitel, a retired phys-ed teacher who owns and operates Natural Escapes with his wife Wenche. They’ve been running the business for 16 years. “It came out of my passion for building the boats,” Terry told me on the way to the 5 Mile boat launch north of the Revelstoke Dam, where we started our tour. Terry was taught how to build the boats by a fellow teacher at Revelstoke Secondary School. He built one for himself, then another for his wife, then one each for his three kids. He was going to have a trailer built to carry them, when the idea came to start giving tours during the summer, when he wasn’t teaching. The boats are made out of thin pieces of birch or oak plywood using a technique called stitch-and-glue construction. The wood is cut out and bent to shape, then sewn together using copper wire. Fibreglass is added to strengthen the joints. The result is a slick and elegant, and natural looking kayak. Natural Escape’s fleet consists of more than 20 boats, including several plastic kayaks that feature rudders which make them easier to keep straight. 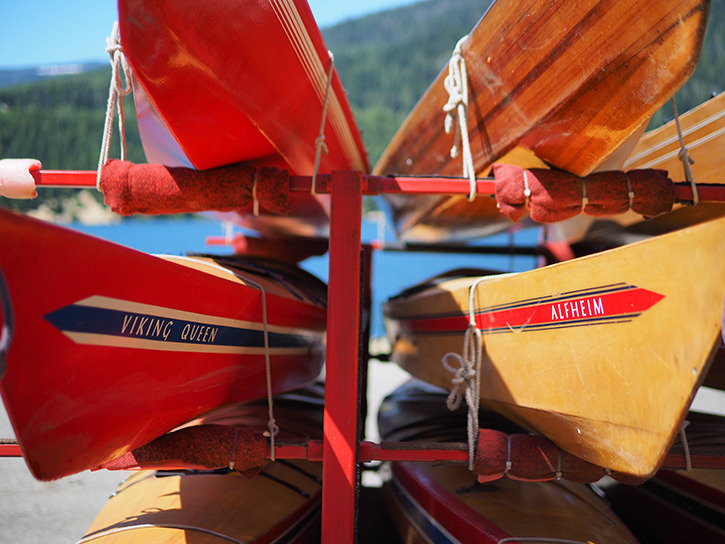 The boats all have Norse names, a tribute to Wenche’s Norwegian heritage. They have names like Viking Queen, Odins Maiden, Lokis Leketoy (Loki’s Plaything), Jotuns Hjem (Giant’s Home) and Alfheim (Elf home). My boat is called Ormen Lange — Long Snake. Our tour starts north of the dam, on Lake Revelstoke — a 150-kilometre-long expanse of water that sees very little traffic. The water is a cool nine degrees celsius, but with the temperature hitting a record 31.5 C that day, it acts as a natural air conditioner. We’re given a short safety briefing before taking off. Sitting on the concrete boat launch, we’re taught how to get in and out of the boats, and what to do in case someone capsizes. That latter bit is crucial for Terry — Natural Escapes rents out kayaks, but only if you can demonstrate how to do a rescue. Finally, we don our lifejackets, put on our rubber sandals, grab our paddles and hit the water. One by one we paddle away to the north, with Frisby Ridge to our west and Mount Revelstoke National Park to the east. We head off towards distant snow-capped mountains, into a blue, green and white landscape. Our destination is a waterfall where Coursier Creek ends its journey from high up in the Selkirk Mountains. The paddling is fairly easy and the boats handle well despite the choppy surface. In a town known for extreme sports, it makes for a relaxing afternoon. Terry says most clients are European, but some also come from down under. 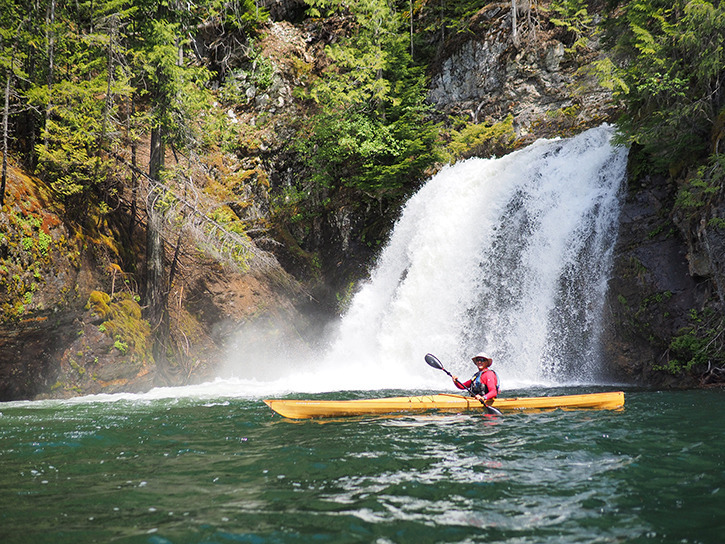 Many have never kayaked and for them the four-kilometre, 1.5-hour tour is a tougher workout. “By the end, most people are feeling it and their arms are sore because most people haven’t paddled before,” says Terry. We stick close to shore to stay out of the waves and make paddling easier. It doesn’t take long until we round a bend, where the thundering waterfall is crashing into the lake. Terry sets up close to the falls and invites us to get up close so he can snap our pictures. This is one of three main trips offered by Natural Escapes. They also take people onto Lake Revelstoke near Carnes Creek, where the reservoir carves a channel into the mountains. A popular trip later in the height of summer, when the water in the Arrow Lakes is higher, is down south, from the Six Mile area across to Begbie Falls. “Our favourite area is south of town, but its only available when the lake comes up,” Terry tells me. With our tour to the waterfall over, we head out into the middle of the lake to take advantage of the winds while we head back to the boat launch. From here, we can see the source of Coursier Creek more than 1,600 metres above in the snowy peaks of Mount Revelstoke National Park. The Begbie and Macpherson massifs dominate the horizon as we speed towards the boat launch. With the wind at our back, it’s an easy paddle back to shore. PHOTO: Terry Beitel paddles in front of Silvertip Falls as it crashes in Lake Revelstoke.